Between you and me, I am a huge fan of hot cocoa, I mean, like a really big fan. I've gone through phases in my life of having a cup of hot cocoa every afternoon. When they kids were younger and napping (boy those were the days), I use to catch up on my shows and drink hot chocolate. It became the thing I look forward to when the kids were not behaving, the house was a mess, and I was behind on my work. And even though it has been awhile since I have indulged in the daily hot cocoa routine, I'm a big proponent of making a batch as often as possible. So when we got hit with snow last week, school was canceled, we headed outside to go sledding and drink hot cocoa. This time, because we needed a little something extra special, I quickly made chocolate dipped marshmallows. It takes about 5 minutes to make, and is well worth it! If you have a favorite homemade marshmallow recipe, please use it here! I love homemade marshmallows, but let's be honest, sometimes theres just no time for that! So take those store bought marshmallows and fancy them up! ALSO! With Christmas just around the corner, I am giving away a ZWILLING Pro 3-pc Starter Knife Set to one lucky winner! Simply comment below what your favorite holiday tradition is between now and December 10th. UPDATE: WINNER HAS BEEN ANNOUNCED. Stay tuned for many more great giveaways this week and next! In a small saucepan over medium-low heat, whisk together the cocoa, sugar, salt and 1/4 cup of the whole milk. Stir until the cocoa and sugar are dissolved. Continuing to whisk, slowly pour in the remaining whole milk. 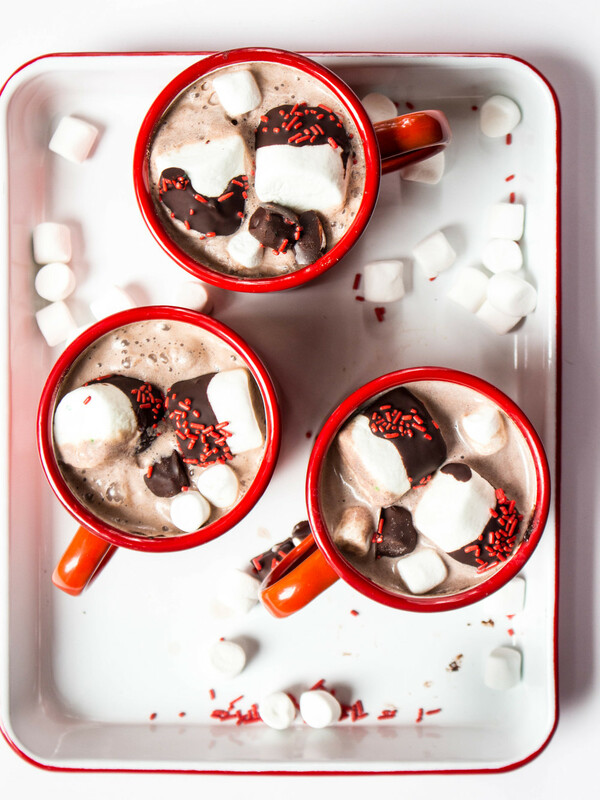 Turn up the heat to medium until the hot cocoa is warm. To serve, pour into a big mug, and give it a stir with your spoon or use my favorite milk frother . Top with chocolate dipped marshmallows. Using a small saucepan, fill with 2 inches of water and heat over medium heat. Place a glass bowl over top, making sure that the water and bowl are not touching. Add the chocolate and stir occasionally until the chocolate is melted. Add in the vegetable oil and give it a good stir. Line a baking sheet with parchment paper. 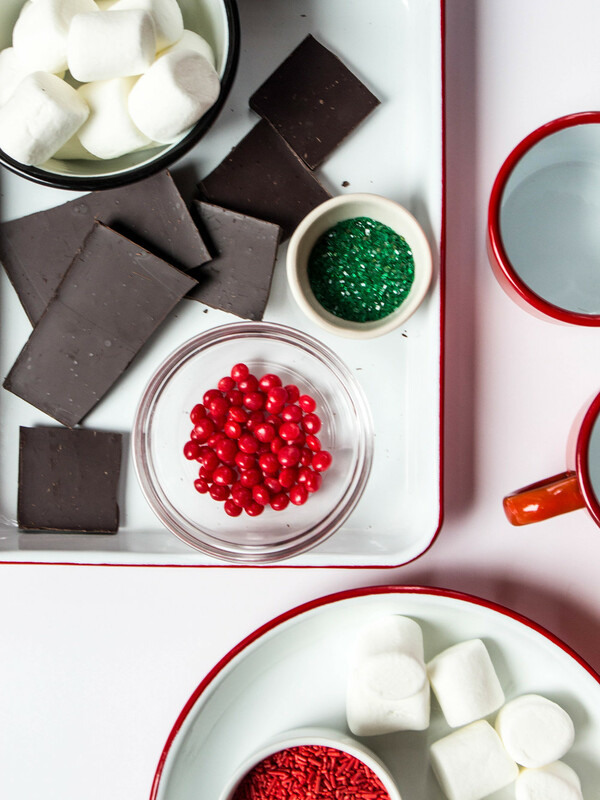 Begin dipping marshmallows into melted chocolate. Place on the parchment sheet and add sprinkles. Continue with remaining marshmallows. Once complete, place the baking sheet into the freezer for 5 minutes to help cool the chocolate.